With the release of Fatal Fury Special, Neo Geo fighting fans were treated to a rather significant upgrade from the previous release of Fatal Fury 2. Not content to rest on its laurels, SNK decided to give the standard series one last hurrah with this fourth and final instalment. And while long-time fans will appreciate the new additions, it also has enough playability and variety to bring in a whole new generation of fighting game aficionados. Fans of Fatal Fury Special should feel right at home with Fatal Fury 3 as it uses the same basic fighting engine, although there are a few new additions to make things a bit more interesting. For starters, you can now control how high your character jumps or flips; how long you hold down the D-pad in the corresponding direction will determine the height of your character's flight through the air. This can prove quite useful at times at which you want to bait your opponent, not to mention when you just need a quick escape. 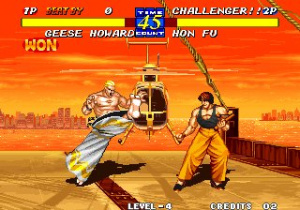 Fatal Fury 3 also builds upon the Sway System that was introduced in Special by adding a third plane. Now instead of only being able to move into and out of the background, your characters can also proceed into the foreground as well. You'll find that this extra layer can make not only your offensive attacks more intricate but add quite a bit of variety to defensive manoeuvres as well. The addition of five new playable characters brings a wealth of new fighting styles and moves to the table. They're all fairly balanced compared to the returning lineup, but as with most games in the genre, you'll soon find that some are obviously more effective than others – especially in multiplayer mode. It's difficult to deny how fluid the Fatal Fury series has become over the years, especially given the sheer amount of tweaks the developers have added with each new release. The combination system remains extremely versatile and the addition of a more ambitious Sway System only proves to add even more depth to an already intricate fighting framework. It's certainly not on par with the later Fatal Fury releases like Garou: Mark of the Wolves, but it's definitely headed in the right direction. The all new backgrounds range from good to incredible. Much like previous releases, some areas are more vivid and complex than others, but the unique way in which the scenery changes from day to night as you progress through a match is still as visually impressive as ever. And when you toss a group of very detailed and well-animated fighters into the mix, you end up with what is easily one of the most aesthetically pleasing releases of the series. Of course, it wouldn't be a Fatal Fury game without a set of rocking musical tracks to carry the tempo of the game along, and this fourth iteration doesn't disappoint. Not only is there a wealth of new tunes to enjoy, but you'd be hard-pressed to find even one that wasn't catchy. The voice announcer can get a bit grating at times, but given the high quality of the other areas of the audio performance, it's tough to complain too much. 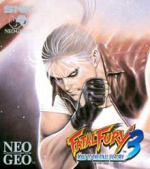 Fatal Fury 3 doesn't stray too far from the patented formula that's made it such a popular series among Neo Geo fans over the years, but the added gameplay mechanics and new characters do give it a very refreshing look and feel. It might not be the complete overhaul some fans were expecting, but it's still significant enough of an upgrade to warrant a purchase, even for those who already own Fatal Fury Special. A good review which more or less summarises my own feelings on the game. Whilst it is not necessarily a massive step forward from Fatal Fury Special it just feels much more refined than previous editions. 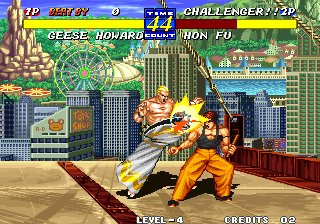 Definitely the best Fatal Fury game outside of the Real Bout series, which I really hope they bring to Virtual Console. This is one series ive yet to push the start button on. This might be one Ill have to pick up and test drive. which is the best Fatal Fury? I have the FF Special and i think to wait the best Garou until then. For 500 maybe 900 not so much. @DarkEdi: My personal favourite is Real Bout Fatal Fury. It´s got the meaty graphics of this game plus an amusing ringout feature where you may break obstacles to kick your opponent out. I haven´t played Garou: Mark of the Wolf that much yet, but almost everyone hold it as the best. 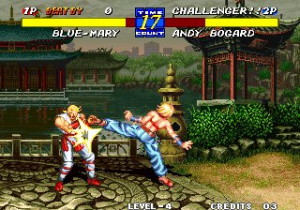 I've never played any of the Fatal Fury games before except for Garou: Mark of the Wolves which is excellent. I would really like to give this game a try. If it ever shows up on the Virtual Console here in the US I will definitely download it. this game is the best in the series,pitty it wasnt in 60HZ. What about the Real Bout games? I have to admit though that when I finally got to play Mark of the Wolves, I found it over-rated. Bass X0 i found mark of the Wolves over-rated to,i have it for my JAP Dreamcast, the Real Bout games are Awesome it would be nice to see them on the VC in 60HZ,not that id worry if they never came to the VC cos ive git them on Mame also. I still prefer FF Special over this one. Got this at the weekend. Its a decent enough fighter despite having zero nostalgia for it (never played it before). It is kinda hard though, even on easy. I've played the demo of FF Special on XBOX 360. I prefer this more. Wow, trying to segregate the "normal" series from the "Real Bout" series is even more painful than I thought. Fatal Fury 3 is an entirely experimental game and isn't worth taking seriously. RBFF solves that problem (it came out so soon after) and even manages to be a "part 2" as far as story.